Business owners spend a lot of time thinking about how to increase their email open rates. After every email you send, you eagerly check your reports and take a look at your open rate results. Are they going up? Going down? Do some of our customers open your emails more than others? Was your subject line the best it could be? At Constant Contact, we do our best to help you interpret your email results and come up with a plan to do even better the next time around. 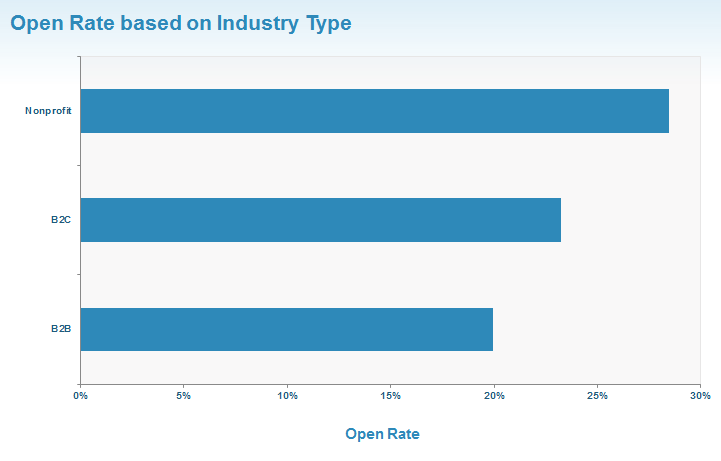 Our business intelligence team loves looking at open rates even more than the rest of us. Some might call their love of open rates a “passion,” others might say “unhealthy obsession” — either way, they spend a lot of time analyzing numbers to offer you data-backed advice on how to send out effective emails. In fact, beginning in January of 2014 they began looking at open rates spliced in a variety of interesting ways — from what devices your subscribers are opening emails on to which email domains produce the best open rates — and we’re excited to present their findings to you today. Segmenting your email list based on audience interest and behavior is one of the most effective ways to increase your open rate. Campaigns sent to 35 subscribers or less, suggesting more personalized content, saw incredible open rates at an average of 55 percent. 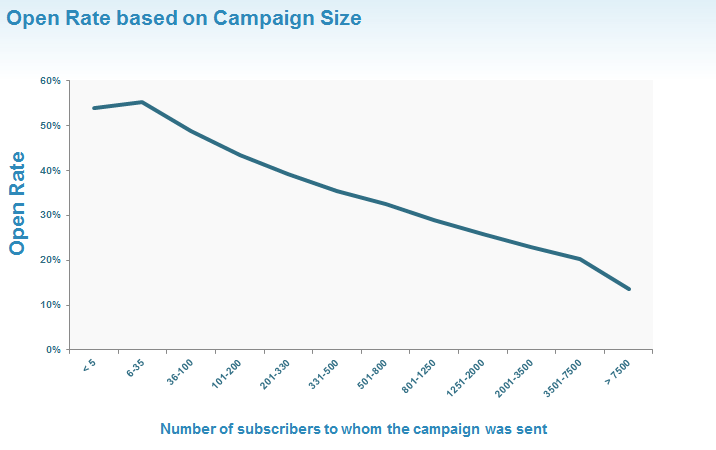 Meanwhile, campaigns sent to more than 7,500 subscribers, suggesting low personalization, averaged about a 14 percent open rate. What you can do today: If you’re still working with one large email list, think about the ways you can reach out to smaller more targeted groups. Are there ways you can organize your contacts based on their location, interest, or purchasing behavior? Here’s some advice for getting started. 2. Make your readers feel personally invested. Good news for nonprofits! Our newest data showed that nonprofits generally enjoy higher open rates than their business-to-consumer (B2C) and business-to-business (B2B) counterparts. 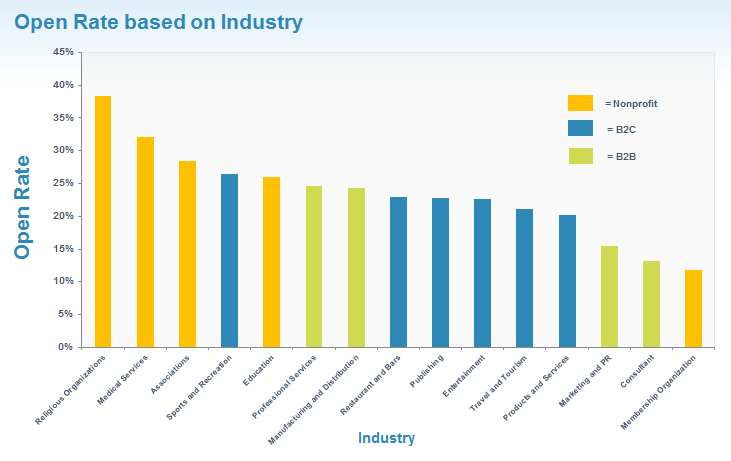 Taking a closer look at specific industries, religious organizations and medical services receive over a 30 percent open rate, while product and service businesses, as well as consultancies, see lower results on average. This speaks to the level of investment email subscribers feel with associations they are passionate about, and offers valuable opportunities for other industries to think about how they can further their connection with subscribers. What you can do today: Think about how you can make your subscribers feel invested in your business by offering something of value. We recommend using an 80/20 rule, where 80 percent of your content offers value to your subscribers and 20 percent is promotional content. If you’re unsure what your specific audience will find useful, send out an online survey to get their input. 3. Keep your contact list up-to-date. How often are you sorting through your contacts to check for addresses with ongoing issues? 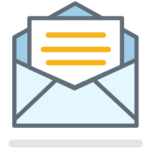 Have you ever sent out an “update profile form” to ensure you’re reaching subscribers at their most up-to-date address? 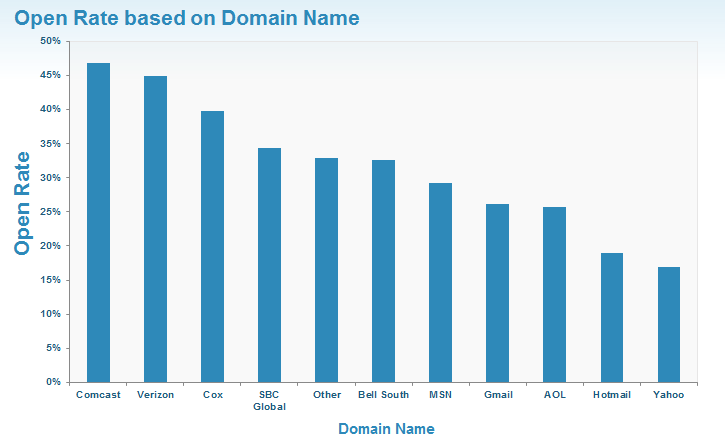 Our data showed that certain email address domains like Comcast and Verizon tend to have the highest open rates, while email accounts through Hotmail and Yahoo accounted for lower open rates. What you can do today: Spend some time getting your contact list organized and look for opportunities to resolve any issues with addresses that may be out of date.